MPPGCL Junior Engineer Previous Papers: Madhya Pradesh Power Generation Company Limited (MPPGCL) has organized the recruitment for Junior Engineer (JE) and Accounts Officer to fill 84 vacancies. And now, they are ready to conduct the test in March 2019. So, candidates who have applied and plan to start the preparation must access the MPPGCL Junior Engineer Sample Papers PDF Download from this page. Also, the interested aspirants can check the latest MPPGCL Exam Pattern. Refer the MPPGCL Accounts Officer Previous Old Question Papers for a better understanding of questions pattern asked in the exams. Hence aspirants who are ready to face the competition can download MPPGCL Junior Engineer Sample Papers PDF at free of cost. MPPGCL Junior Engineer Model Papers PDF contains the previously asked questions which are helpful for the aspirants to crack the exam easily and get the dream job. Aspirants who practice the more and more MPPGCL Junior Engineer Model Papers PDF can easily get the clear idea regarding the online examination. Also, you can get all the subject wise MPPGCL Junior Engineer Previous Papers in PDF format from the provided links. The candidates who are applied for the Junior Engineer and Accounts Officer Jobs may be searching for the MPPGCL Junior Engineer Previous Papers PDF. Because for the applicants, the MPPGCL Junior Engineer Sample Papers PDF are the best way to prepare and preparation materials for the exam preparation are mentioned in the below section of the website. So refer the entire article for the best utilization purpose. 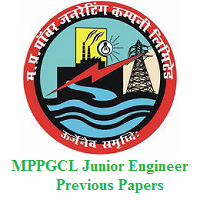 The MPPGCL Junior Engineer Previous Papers PDF is updated now to download. Hence, the candidates can check the MPPGCL Accounts Officer Previous Old Question Papers for the preparation purpose. The candidates who applied for the मध्य प्रदेश पावर जनरेटिंग कंपनी लिमिटेड should have an idea about the MPPGCL Exam Pattern. So that it helps for your preparation session. Aspirants can make a schedule based on the below exam pattern and do concentrate on these fields and practice the MPPGCL Accounts Officer Previous Old Question Papers mentioned in the links, for sure it helps you for cracking the online examination. Aspirants who applied for the MPPGCL Junior Engineer and Accounts Officer can refer to the MPPGCL Selection Procedure on this article and each and every candidate should undergo the below mentioned rounds. Based on the eligibility criteria and merit performance the candidates who appeared for the online exam will be shortlisted. The one who cleared the written test will have the Document Verification round for the security purpose. so beware of the sectioning procedure and prepare yourself for the mentioned rounds. People need to solve plenty of questions from the MPPGCL Junior Engineer Previous Papers PDF to get the experience and to improve your time management. Candidates can also check GK and Current Affairs from our site. Aspirants should need proper preparation to get a good score in the online examination. So, all the candidates are requested to start preparation to crack the job and get placed in मध्य प्रदेश पावर जनरेटिंग कंपनी लिमिटेड. We are in the hope that the given MPPGCL Junior Engineer Model Papers PDF is sufficient for your online exam preparation. Moreover, bookmark Fresher Now website for more other details. As well as if you have any doubts you can feel free to ask. We will get back to you as soon as possible. On the other hand, you can also visit the official website of MPPGCL for more details about MPPGCL Accounts Officer Previous Old Question Papers, MPPGCL Exam Pattern, MPPGCL Selection Procedure.